A look at Canberra’s role – or lack thereof. The Prime Minister could hardly have said anything else without being accused of gross hypocrisy, because his own Liberal-National Coalition government had come into power on a platform which included a pledge to “stop the boats” then arriving in Australia. Upon taking office in September 2013, the Coalition government implemented the military-led Operation Sovereign Borders, which involves, among other things, the turn back of unauthorized maritime arrivals to Indonesia (usually their most recent country of departure) or, in the case, of those arriving directly from their country of origin, hand back to country of origin authorities. On 20 May 2015, the Foreign Affairs Ministers of Indonesia, Malaysia and Thailand met in Malaysia to discuss their common problem and subsequently issued a Joint Statement setting out agreed upon “interim measures” for dealing with it. Among other things, Indonesia and Malaysia indicated that they would provide “temporary shelter” to the estimated 7,000 people stranded at sea, but they made it clear that they expected the “international community [to] take responsibility for the repatriation of the irregular migrants to their countries of origin or resettlement to third countries within a period of one year.” When asked the following day whether Australia would be offering resettlement places, the Australian Prime Minister gave his now infamous “nope, nope, nope” response and justified it by suggesting that such an offer would just “encourage people to get on boats”. 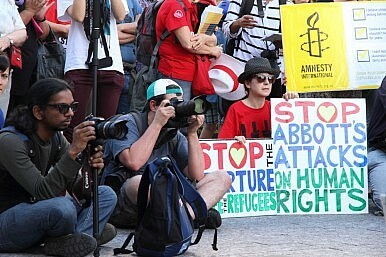 Essentially the same justification had been proffered in November 2014 when Australia announced that asylum seekers who registered with the Office of the United Nations High Commissioner for Refugees (UNHCR) in Indonesia after 1 July 2014 would not be eligible for resettlement in Australia. All those who mentioned long-term settlement did so for the purposes of indicating that this was not a durable solution for the Rohingya problem and that it would constitute a pull factor. This was not just national delegations who said this. The UNHCR was in fact the most articulate and persuasive on that point. The Australian government’s position is that irregular migration should be stemmed at the source, or failing that, as close to the source as possible. At the 29 May meeting, the Australian delegation outlined Australia’s strategies for achieving this end, which extend well beyond turn backs and hand backs of unauthorized maritime arrivals to embrace, among other things, law enforcement cooperation and border control capacity building through fora such as the Bali Process on People Smuggling, Trafficking in Persons and Related Transnational Crime and also through bilateral engagement with countries across the region. While Mr Goledzinowski denied that Australia had proselytized for regional countries to adopt its approach, he informed a Senate Estimates Committee that there had been particular interest in Australia’s anti-people smuggling communications strategies and that he expected one or more countries to seek further assistance and advice on implementing such strategies. More constructively, Australia provides funding to UNHCR and IOM to support irregular migrants, including Rohingya, in Indonesia and some other regional countries, though it should be noted that Australia reduced its funding allocation to both organizations in the 2015-16 budget. Australia also provides aid to Burma and Bangladesh. On 20 May, Australia announced that it would be providing AUD 6 million in extra “humanitarian assistance to people in need in Burma”, including in Rakhine state where most Rohingya live. On 29 May, it announced a further AUD 5 million in humanitarian assistance for Rakhine state and the Cox’s Bazar region of Bangladesh which hosts many Rohingya. However, there was an element of “smoke and mirrors” in these announcements. As a cross-bench Senator pointed out at Senate Estimates, Australia’s regular bilateral aid program to Burma was reduced from AUD 70.1 million in 2014-15 to AUD 42.1 million in the 2015-16 federal budget released earlier in the month. Similarly, Australia’s regular bilateral aid program to Bangladesh was reduced from AUD 70.1 million in 2014-15 to AUD 42.1 million in 2015-16. In other words, considered overall, Australia is proposing to do less not more to assist the two countries via its aid budget. To the extent that economic underdevelopment in Burma is operating as a “push factor”, the provision of aid money to that country makes sense as a strategy for addressing irregular migration. However, the Australian government acknowledges that the main push factor in the case of the Rohingya is the persecutory treatment to which they are subjected in Burma. Apparently, Australia has expressed concerns about the treatment of the Rohingya in bilateral discussions it has had with the Burmese government over the years, including on the sidelines of the 29 May meeting. The fundamental problem with all initiatives to address so-called root causes is that they will only yield results in the long-term, if at all. Such initiatives need to be pursued, of course, but they should not be considered a substitute for providing solutions for the plight of individuals displaced in the meantime. What displaced Rohingya need right now and above all else is a home: a place where they can live in safety, support themselves with dignity, give their children a future through education, and belong. Unfortunately for them, the thing they most need is also the thing which Australia and other countries in the region are least willing to provide. Dr. Savitri Taylor is an associate professor at La Trobe Law School. Her area of research interest is refugee law and asylum policy at the national, regional and international level. She is Deputy Editor of the refereed international relations journal Global, Change, Peace and Security and is also very involved with the refugee sector in Australia, especially as a member of the Management Committee of the Refugee and Immigration Legal Centre Inc in Victoria. Their plight is an all-too-familiar story in the region.